Mystery Photo No. 46 is actually two photographs kindly sent to us by Ian Gibson. What did the two photos have in common? Approximately when were they taken? 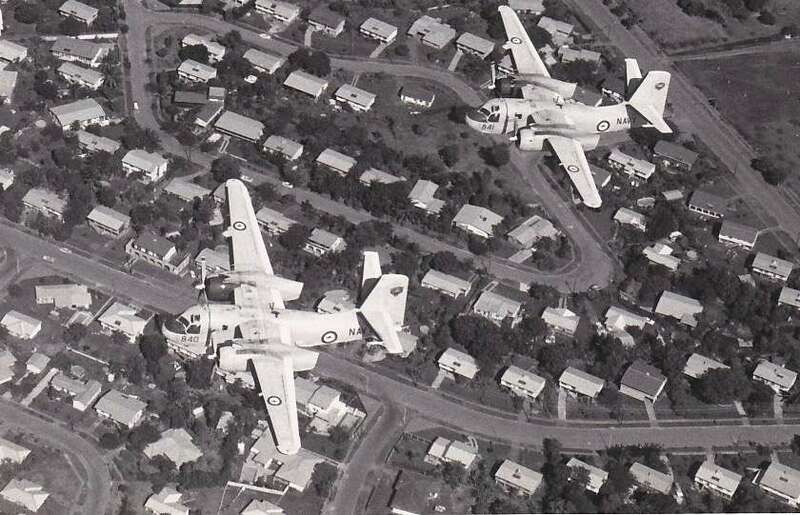 The two photographs are of a pair of Trackers flying over a suburb of Darwin, but there it more to them than meets the eye. 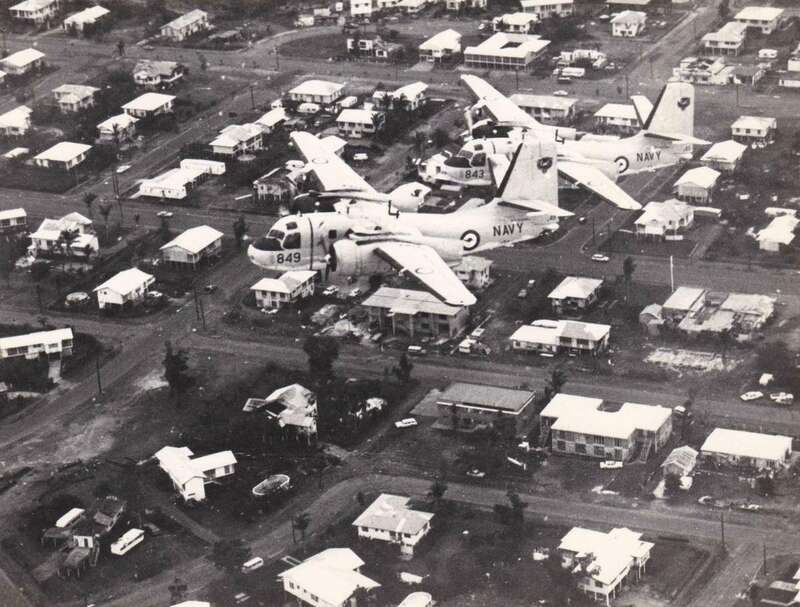 The 849/843 shot (upper) was taken over the northern suburbs of Darwin shortly after Cyclone Tracy struck the city in December of 1974. Evidence of the cyclone damage to the housing can be easily seen. 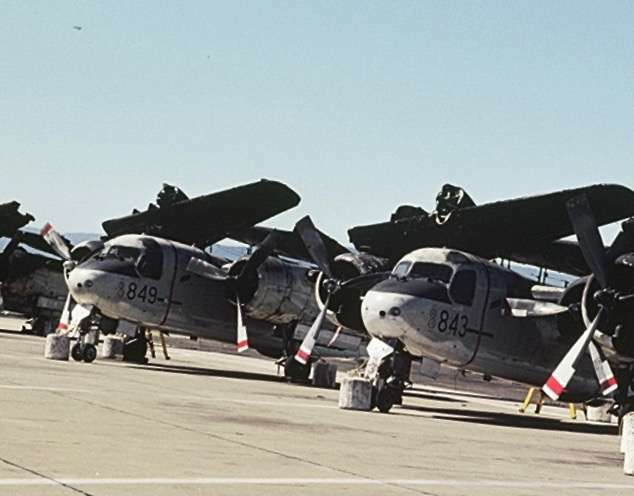 These aircraft were build numbers 153604 (849) and 153598 (843), which at that time were employed on Operation ‘Seawatch’ – surveillance of waters to the north of Darwin to detect illegal fishing/immigration. By the beginning of December 1976 all Operation Seawatch aircraft were back in Nowra, however. Indeed, on the night of 4th December all but one of the RAN’s entire Tracker fleet were in ‘H’ hangar, which was when they were put to the torch by a disgruntled sailor. Of the 12 aircraft in the hangar that night, only two could be salvaged to flying status, although they were badly damaged (as can be seen from the photo on the right). They were 849 and 843, the very two aircraft in the upper image above. The two Trackers were subsequently repaired and were ‘rebadged’ as 840 and 841, and in the course of time found themselves in Darwin again for Operation Seawatch, which was still in progress. Ian Gibson was the OIC VS816 Squadron Detachment at the time and, having seen the first shot, and realising the only two S2Es to survive the fire were now with the detachment as 840 and 841, organised another formation practice to capture the second image. It was taken in 1979. You can read all about the Fleet Air Arm’s Trackers, including a full ‘History in Photograph’ section (which includes a rare compendium of H hangar fires, here.